Are Rex Ryan’s days in New York numbered? Well, according to NFL on FOX insider Jay Glazer, Ryan told his players in a team meeting on Saturday night that word on the street is he’s getting fired. It’s unclear whether this was done to motivate his team or whether he was really giving a heads-up to the 53-man roster. After the Jets’ 24-13 win over the Browns on Sunday, Ryan responded to Glazer’s report and didn’t exactly deny it. "What’s said in a meeting or whatever will stay there," he said. "Whether that report is accurate or not, I’m going to tell you this — those things, that’ll stay in-house." Asked if he knew whether he’d be back next season, Ryan said, "No, I know I have a contract next year." Ryan, who was hired as the Jets head coach in 2009, carried out a plan of action to build team chemistry and instill confidence in his players. It paid off. Ryan led his team to back-to-back AFC Championship Games. But he’s been searching for similar success over the past three seasons. Although the Jets have won just six games entering Week 16, they have exceeded a lot of people’s expectations. Bright spots on the defense — including Defensive Rookie of the Year candidate Sheldon Richardson — offer signs of hope for the future, but it would be no surprise if Jets general manager John Idzik wants to hire his own guy. 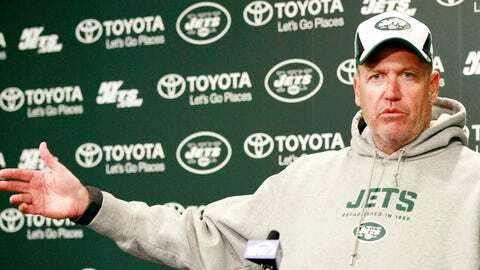 Idzik was promoted last offseason from his previous title of vice president of football administration.